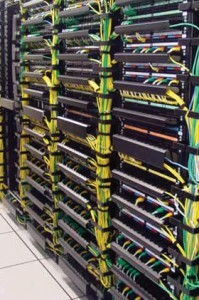 Blog - Summit Communications, Inc.Summit Communications, Inc.
Security Info Watch put out this article on Cat 5 and Cat 6 cabling. In case you’re wondering what actually goes into the cabling that makes up your network let’s take a look at the differences. Category 6 cable, commonly referred to as Cat 6, is a standardized cable for Gigabit Ethernet and other network physical layers that is backward compatible with the Category 5/5e standards. Cat 6 extended key parameters over Category 5e specifications — the most prominent difference being the frequency at which those key parameters are measured. Compared with Cat 5 and Cat 5e, Cat 6 features more stringent specifications for crosstalk and system noise. The cable standard provides performance of up to 250 MHz (as opposed to up to 100 MHz for Cat5e) and is suitable for 10BASE-T, 100BASE-TX (Fast Ethernet), 1000BASE-T/1000BASE-TX (Gigabit Ethernet) and 10GBASE-T (10-Gigabit Ethernet). The test limits are different between Category 5e, 6, and 6a. Marketers will sometimes take advantage of those that do not dig into the details. A 350MHz Category 5e rated patch cord will not pass a 250MHz Category 6 test. At 100MHz, a Category 6 cable has a 19.8dB limit vs. a Category 5e cable which has a limit of 22dB. These values are different enough to have a negative impact on your network. The Cat5e standard has no values above 100MHz. Some marketers will interpret values and project them up to the 250MHz level. That is not an accurate method. The standard is what it is and can’t be changed. If you are looking for Category 6 performance, then quality Category 6 cabling and components are required. When it comes to great looking racks, Summit Communications runs with the big dogs, which is why we were surprised to find out too late that there is a contest for such designs. We’ll have to take part in this one next year. The contest for Greatest Looking Racks is put on by Middle Atlantic Products and we are going to do our best to make sure we get an entry into this one the next time it is held. The winner was chosen to be Electreonic Lifestyle Associates. Their installation didn’t just include low voltage cabling, but also included a host of environmental, security, and entertainment solutions. Beyond these the system can also handle all of their lighting and the devices connected to the network can be reset remotely using iPads or other devices. The firm’s detailed prewire schedule and planning made pulling 3.8 miles of low-voltage wiring extremely organized and efficient, Elliott reports. The wiring covered HD video, surround sound and stereo audio, networking, telephony, lighting control, motorized shading, surveillance, accent lighting and environmental control systems. Additionally, ELA can reset every device in the system with remote management capability. While this dream setup might not be within the budget for every home, it’s important to note that solutions like these are scalable and can be tailored to any home. The way they set these racks to roll out of the wall is pretty nifty and seems to have made the 3.8 miles of installed cable flow from one central location is awesome. Depending on customer requests we may get an entry into next year’s competition. Moore’s law is a pretty amazing occurence. “Moore’s law” is the observation that, over the history of computing hardware, the number of transistors in a dense integrated circuit doubles approximately every two years. They accomplished this by banding the fibers in an existing cable. As it stands, the entire internet backbone consists of single-mode glass and plastic fiber. These fibers can only carry one mode of light — which, in essence, means they can only carry the light from a single laser. (It’s a bit more complex than that, but it’s beyond the scope of this story to explain it any further.) You can still use wavelength division multiplexing (WDM) to push insane amounts of data down a single fiber (a few terabits), but we will eventually run up against the laws of physics. It’s hard to guess at what the future holds in terms of data transmission. Obviously with fiber optics being the fastest as of late, wired systems are still proving to be the top of the line for faster internet speeds and better video quality. Enter Eastern Washington University and their latest residence hall; a Cat 6 system that has been designed to be future-proof for modifications down the road. Every student room has multiple connections for data and television. The student lounges also have a number of visual connections and presentation areas. The infrastructure also supports a full camera surveillance system and a robust wireless network for wireless devices. What makes this particular system so interesting is that all the visual signals are transmitted via Cat 6. This system is unique in that it supports IPTV, a new standard that has yet to fully catch on. IPTV gives viewers the option to seek out individual RSS Video feeds or other syndicated video formats. Think of Internet Protocol as a “language” that devices use to communicate over a computer network. IP is not the same thing as the Internet. Rather, it’s the same language used by the Internet. IP technology allows information to be sent and received over any broadband or network connection. When all of your devices and services — now including your TV — speak the same language, they are able to easily work together in new ways. Program your DVR from your PC or wireless phone… Display personalized content and applications from the Internet on your TV…Even view your home phone’s incoming call log on your TV screen. With all the talk of wireless, it seems this college has put their resources firmly in the cabled network camp. This is not surprising given the transfer speeds. For now, it seems Eastern Washington University is planning for anything and that’s always a good bet. Datacenter Dynamics just put out this great piece on 10GBase-T networks. These networks operate in the frequency spectrum at around 500 MHz and much of this cross talk interference occurs at the 250-500 MHz range. The solution? You can either have a shielded or unshielded solution to avoid this cross talk. A cable shield offers additional mechanical stability as well as reliable protection against unwanted signals and the resulting crosstalk. Shielded cabling, by design, automatically curbs ANEXT if it is installed correctly and is of a sufficiently high quality. In many respects, shielded cables are an ideal solution for 10GBase-T. However, the shielding for this type of cable must be handled carefully and consistently. Because many markets have not traditionally used shielded cables, installers in these markets have little experience in the correct way to handle shielding. Unshielded copper cabling is easier to install, and therefore less expensive. This is an important part of the reason for its widespread global adoption. A safe bet would be to choose cabling specified in accordance with class EA as stipulated by ISO/IEC 11801 coupled with connection technology in accordance with Cat. 6A as stipulated by IEC 60603-7-41/-51. Compared with Telephone Industry Association requirements, this standard has stricter regulations regarding transmission parameters. Therefore, it is better equipped to cope with the challenges that the future will bring. The technology, called XG-FAST, is an outgrowth of a standard undergoing final review at the International Telecommunications Union, called G.fast. The G.fast specification calls for the use of a wide spectrum range of 106MHz – far larger than that used by existing DSL technology. Effectively, G.fast can send or receive data much faster than conventional DSL, though it can only do so over comparatively short distances, around 100 meters. This means that businesses that aren’t currently wired for fiber optics may soon have new speed options with an existing copper connection, although some retrofitting may be required. The technique is based on the G.fast standard being considered by the International Telecommunications Union; it’s a DSL standard designed to sustain 500Mbps connections over legacy copper cable networks using a 106MHz frequency range. Marcus Weldon, president of Bell Labs said “Our constant aim is to push the limits of what is possible to ‘invent the future’, with breakthroughs that are 10 times better than are possible today.” While many urban areas are either already wired or being wired for fiber optic cabling, this discovery could have a major impact on rural areas where network providers are less likely to build out fiber optics due to cost concerns. If this new transmission technology becomes adopted it may mean that some companies will need to update their network cabling accordingly, but it will likely depend on the individual network. Thinking Of Moving Your Business? Read This First. Businesses relocate all the time for different reasons. One of the biggest concerns when moving your business should be migrating your existing data/voice network to the new location. While this may seems like a headache, there are a few considerations you can make that will help guide you along the way as well as pitfalls you will want to avoid. Unless your business is in the telecom industry, these questions may be tricky. At this point you’re just in the research phase and you have the benefit of being able to engage a professional to provide you with feedback on your needs and may discover some issues that you didn’t know you had. If you are leaving the service area of your current provider you will want to determine if your existing services are supported by a new provider in the area you are considering. Now is also a good time to ask yourself “Would it be cost effective to upgrade at the time of the move?” As you will already be engaging telecom professionals to migrate your hardware, now is a great time to ask them about any new features you may have been considering. The ultimate takeaway you should make here is the necessity of engaging the right talent to get your system up and running at the new location. Turning to a trusted provider like Summit Communications puts you in good hands with seasoned professionals who can evaluate your specific situation and make recommendations accordingly. Moving can be stressful so make it easy on yourself by hiring the right team to get you there. GEORGE TOWN: Hospitals must stop using automated phone systems to answer calls, Penang Consumer Protection Association president K. Koris Atan said. “Hospitals are for emergency purposes and should have operators instead of an automated phone system answering calls. Can you imagine what it feels like to not be able to get through during an emergency? The anxiety is simply dreadful. Quick response makes all the difference. “Service providers must have a social responsibility and not give the public ‘a merry-go-round’ – press one for English, two for Bahasa Malaysia. It goes on and on,” Koris said yesterday. He said he had received a complaint that a private hospital’s telephone operator had failed to answer despite being called eight times. “Each time, a recorded message asked the caller to press the extension number. How would the caller know the doctor’s extension number?” Koris asked. Penang Health Association chairman Datuk Dr Chan Kok Ewe said telephone operators must not take too long to answer calls. “It is their responsibility to answer calls. Normally, if the telephone operator is busy on the line, it would take one to two minutes before the caller can talk to the operator. “I have experienced it myself and it took me about one to two minutes to speak to a telephone operator at Island Hospital Penang,” said Dr Chan, who is also Island Hospital Penang chief executive officer. “Those who know the extension number can dial it. “However, that applies more to internal staff of the hospital. “Our hospital, however, has a 24-hour telephone operator service,” he said yesterday. On Sunday, Koris had asked government agencies and companies to install more user-friendly call systems rather than automated phone systems, which he said were too complicated, especially for senior citizens. Penang Senior Citizens Association president Lawrence Cheah described the automated phone system process as stressful.